EL SALVADOR—The recent struggle for clean water and an end to dirty water for the 700 workers of a factory gave us the opportunity to analyze our participation as communists. Women and men workers from an ICWP club in the maquila factories met to analyze the class struggle and how to put forward communism as the order of the day. First, the members of the club took the opportunity to talk with women and men workers about the dirty water problem and organize more workers for the struggle for communism. Many workers came to this meeting to listen to the discussion of the water problem that was affecting all the workers and to see the solution that was given to this type of problem. All the workers decided under the leadership of the party that if the boss did not solve the problem immediately, they would stop working. In the face of the threat, the bosses arrived with a bag of water for each worker and thus tried to calm our thirst for struggle. Water in plastic bags? This bothered our class more, and, seeing this, the bosses brought technicians to repair, (now yes) the water pump, so that now it did not come out so dirty. We have been discussing our participation in this activity. In the meeting of the local central committee that was held a weekend later, the meeting was supposed to end at a certain time of the afternoon, due to the distances to where each one of us lives. But the meeting was so intense and instructive that night came and we did not even realize it. In this meeting there was a report on the discussions that took place in a meeting of the leadership of the party about this type of struggle and referred to our participation in this type of action. There was criticism that the reform, and not the communist revolution, was primary. This led us to reflect if we are on the right path or if we need to re-evaluate our work trying to recruit more workers for the ICWP. As members of ICWP, after this evaluation on the action for clean water we had an informal meeting inside the factory. We made it clear to the workers that all of these kinds of problems are the result of the capitalist system and we told them that we should fight for our communist society. Without a doubt in the day-to-day work in the factory, we are learning to put our communist line in front. This action we did has taught us that we must talk to the men and women workers directly about communism. 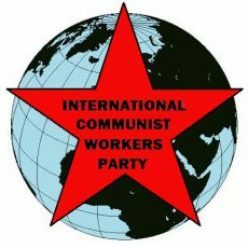 This should be our main objective, to organize directly for Communism and not for reform. It also motivated us to read more carefully the articles about struggle in Red Flag and how the Boeing workers took advantage of talking about communism during a problem in the factory. This is a collective learning experience. In Communism there will be clean water for all, since the health of workers will be the priority. We believe it is necessary to continue the discussion about our main objective to mobilize the workers to communism.